Two teams made Rutgers history by winning the Hult Prize Regionals Competition for their groundbreaking energy innovations. Known as the Nobel Prize for students, the Hult Prize is the world’s largest engine for innovative startups emerging from college campuses. This year’s challenge was to build a scalable, sustainable social enterprise that harnesses the power of energy to transform the lives of 10 million people by 2025, according to the Hult Prize challenge document. Students on the SULIS team developed energy-efficient water sanitation devices that function under a range of weather conditions. The groundbreaking technology harnesses energy directly from the sun, enabling it to sanitize water without relying on existing infrastructure. Not only is it more efficient and less expensive than existing methods, the product can be manufactured by local workers using locally-sourced materials. 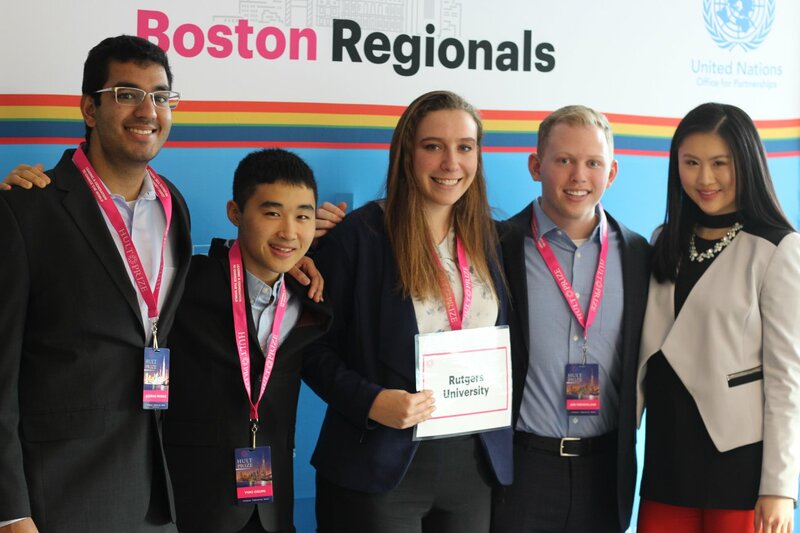 The SULIS team—comprised of Honors College students Anurag Modak, Sarah Pomeranz, Yuki Osumi, and Ari Mendelow (pictured above)—won the Rutgers Hult Prize pitch competition in December 2017, advancing to the Boston Regional competition where they captured first place in March. The LivingWaters team was driven by a desire to alleviate the global water crisis. The project’s goal was to create a method for capturing fresh rain water and maintaining the water's quality until use. The resulting LivingWaters System is a cost-effective, zero-energy rainwater catchment system that captures, filters, and stores an abundant supply of clean rainwater. Team members Joshua Kao, Thomas Irving, Jane Peterken, and Shrey Ghate applied to the Hult Prize challenge online and advanced to the Shanghai regional final, where they beat out over 50 of the top Asian universities. Both SULIS and LivingWaters will participate in an intensive 8-week summer business incubator, where they will receive training to launch their new social businesses. In September, finalists will pitch their projects at the United Nations for a chance to win $1 million in funding. Last year, a Rutgers team won the $1 million for Roshni Rides, a transportation network solution for urbanized refugees. Several of the winning team members are School of Engineering students. Ari Mendelow is an industrial and systems engineering senior, while Jane Peterken and Shrey Ghate are seniors studying civil and environmental engineering. Ghate agrees that one of the greatest assets from an engineering background is the problem-solving mentality. “No matter how complex or big or challenging it is, engineering school teaches you to break it down to its simplest constituents, look at the constraints and then find a way around it,” she said. At the same time, she highlights the importance of the technical skills that the engineering students brought to the table. “There's a wealth of technical know-how that comes with going through a rigorous engineering curriculum such as the one offered at Rutgers, and that gives us a better insight into not only how some of these cutting-edge technologies work, but also what some of their limitations are,” Ghate said. The other SULIS and LivingWaters team members came from an array of business and science backgrounds, bringing a diverse set of skills and perspectives to the table.